A few weeks ago, I wrote about us switching our reservation system to a product by the website company Yelp. The first week, we installed their seating system and floor management software. The second week, we started installing their online reservation system. I can say it is not very often are you 100% pleased with a company's product and service. The entire experience has been outstanding. Now that this is up and running, I think it's fascinating how it will change making a reservation... and with that, dining out. 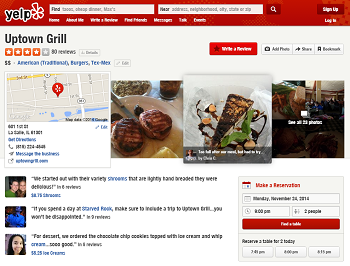 The "widget," as they like to call it, makes it so incredibly easy and fast to make a reservation. Once you have done it once, the second time takes maybe 5 seconds. To get to the "widget" you can either go to our website www.uptowngrill.com or to yelp.com. Just simply pick a date, a time, the amount of people and click send. The system automatically checks for availability and sends you an email confirming your reservation. From this email, you can click a link to change the time, the amount of people, or even cancel (hopefully not). Again, the entire time, the website checks to make sure that your request is available to you. This system brings us into a whole new era for reservations. I believe people will be more apt to make reservations - and on much shorter notice. For example, you're leaving your office, headed to the Uptown for a business lunch. You pull out your smart phone... click, click, click, you are in our system. Or maybe you're at the mall looking for a post-shopping snack. The convenience is awesome! Holidays like New Year's Eve, Valentine's Day and Mother's Day will also benefit from the new system. In the past - to optimize the use of our tables - we would typically take a deposit for larger groups. With smaller tables, we would take a phone number and have an army of staff calling to confirm (or reconfirm) in the days leading up to the reservation. Because of people calling to cancel or change their reservation, there were days it took three staffers just to answer the phone. Not to mention the servers who might be working on these days having an open table or open tables in their station because of no-shows. Some New Year's Eves, for example, we have had as many as 20% no-shows. Yelp SeatMe allows us to take credit card numbers as a "deposit" for days like this. So during high demand holidays, will you be asked for your credit card number (used on a third party, secure website). Your card simply reserves your table and will not receive any charges. However, a $10/person cancellation fee will appear if you fail to honor your reservation (or fail to cancel by the morning of December 29th in the case of New Years). This practice will help us cut down on our no-shows and allows us open up a table to last minute callers if one suddenly becomes available. This New Year's Eve, we will take a credit card to hold every reservation. You will be able to make reservations online or by calling us at 815.224.4545. Online, making a reservation is as simple as clicking on our reservation site, then finding the time and the amount of people that you want. You don't have to bother us, and we don't have to bother you. If you need to make a change to the reservation, you can go to the site, change your number, or change your time as long as there is an opening for you. I know this policy might be novel in the Illinois Valley. I promise you this is the wave of the future. Many places in the city are already doing this. We have no plans to use the deposit option except on the 3 days a year it make sense for us and for the customer. Having open tables because of people not honoring reservations or not providing enough notice in canceling costs us, and it really affects the servers working that holiday. While adding convenience for the customer, we have added some security for us. I hope you can understand our feeling that we need to do this. I must also remind our customers - on New Year's Eve we don't increase prices. We serve our regular menu with the exception of sandwiches. Anyone who has been here on for New Years can also attest to our festive atmosphere! Don't you kind of wish it was January 1st already?